Born in the late eleventh century of a princely family, in the archiepiscopal city of Armagh, Saint Malachy was raised in the fear and love of God. He seemed to have the virtues of maturity hidden under the appearances of childhood. Praises did not inflate him, and reproaches did not sadden him. He had a horror of idleness, and a command from his preceptors was always like a law for him. He would often separate from his companions to converse in prayer with God. When he was still a young man, he made himself the disciple of a holy hermit who had established a little cell near the cathedral church of Armagh. The archbishop of Armagh made him a deacon of his church, and when at the age of twenty-five he was ordained a priest, commanded him to preach the Gospel and catechize his people. He uprooted vices and corrected abuses, and the archdiocese derived great profit from his ministry. 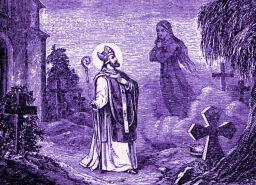 An episode from the life of Saint Malachy teaches us several truths concerning purgatory. He had a sister who was very worldly, and whom he found indifferent to his efforts to lead her to reflect on the reason for her existence and her last ends. He learned one day that she had died after having manifested regret for her sins, and he offered a Mass for her soul; but he did not think of continuing this practice. After thirty days he heard in a dream that she was standing outside the church and had not eaten for one month. He began again to pray for her, and then in a dream beheld her clothed in a black robe, near the door of the church but unable to enter. He continued his suffrages, and on a third occasion saw her in a robe which was more or less white, having entered the church but unable to approach the altar. The last time he saw her she was within the church, clothed in white and near the altar, in the company of the just. We learn from this how serious our indifference and lack of love for God are; that our prayers are efficacious in relieving our dear ones; and that it is ordinarily a little at a time that souls are delivered from the bonds of their sins and negligence. Saint Malachy brought about several miracles, and manifested great devotion and zeal in the reconstruction and re-establishment of a monastery whose nine hundred religious had been massacred by pirates; these facts led to his being consecrated Bishop of Connor, a small see whose inhabitants were Christian in name but pagan in practice. The venerable pastor taught the people with patience and warned them with gentleness. He endured many insults and outrages, but finally the hardened hearts were softened and began to listen to his voice and instructions. He remained in this see until a hostile king and his army decimated the city of Connor. At that time, the Archbishop of Armagh was nearing death and named him to succeed him in this metropolitan see, overriding his humility and protestations of insufficient virtue and competence. Again he had a great deal to suffer in the exercise of his new charge. The see of Armagh, by a longstanding abuse, had been held somewhat like a throne by one single family, and it required on the part of the Saint no little tact and firmness to calm the dissensions caused by his election. Ecclesiastical discipline had been forgotten, and depraved morals everywhere had virtually annihilated faith and piety. The good bishop who had named Saint Malachy had labored to correct the abuses, and hoped his virtuous successor might better succeed in the same post. Nonetheless, two years passed before Malachy could even enter into the city as its archbishop; troops were levied against his entry by the pretender to the same title. Saint Malachy had accepted the office on the condition that he assume the charge only after the death or flight of the false bishop, for he did not want to cause a war and the death of those whose salvation he desired to procure. The pretender and his cousin, with several others of the same lineage, were struck down soon afterwards by the hand of God, and their exemplary chastisements gave great credit to the Saint, and enabled him to make ordinances to countermand the disorders. He divided the diocese and left the larger portion, that of Connor, to a colleague, a very holy man worthy of the charge. He retired to the other part, the new see of Down. There he convoked synods, renewed ancient ordinances and made appropriate ones; everywhere he intimidated sinners and implanted religion and piety. We must not neglect to mention the famous prophecy of Saint Malachy, in which he assigns to every Pope of the future a motto describing each pontificate, from his own day until the last Pope he mentions, whom he calls Petrus Romanus  Peter the Roman. After the motto attributed to the present Vicar of Jesus Christ (in the year 2000), De Labore Solis, only one, De Gloria Olivae  From the glory of the Olive Tree  separates us from Peter II. The prophecy, which begins with Celestine II (1143-1144), was discovered in 1590 and includes one hundred and eleven mottos. Many a motto has been shown to have a striking exactitude in the description of its subject and his pontificate. Many interpreters have labored to prove the prophecy's accuracy. Saint Malachy twice made a pilgrimage to Rome to consult Christ's Vicar, the first time returning as a Papal Legate for all of Ireland, amid the joy of his people. The second time, however, he was bound for a happier home; he was taken ill in France at the monastery of Clairvaux, where his great friend and biographer, Saint Bernard, was Abbot. He died there in the monastery where he would gladly have lived, at the age of fifty-four, on the 2nd of November, 1148. Saint Bernard, in his Life of Saint Malachy, narrates many of his miracles, one of which he himself brought about, when he touched the paralyzed arm of a young boy to that of the mortal remains of the bishop, while he was laid out in his coffin at Clairvaux. It was instantly cured. I know how to live humbly, and I know how to live in abundance.